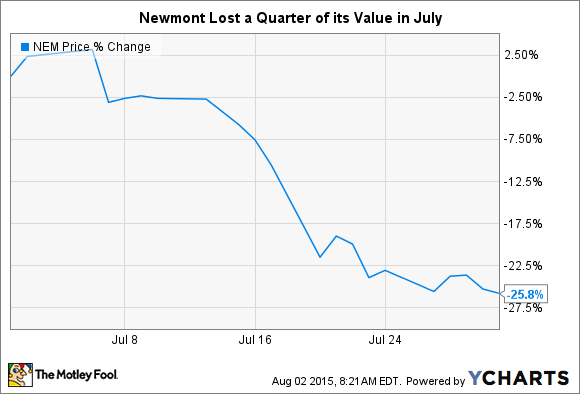 What: Newmont Mining Corporation's (NYSE:NEM) shares fell nearly 26% in July. The drop in the price of an ounce of gold was the main driver of that, as the precious metal slipped below what many believed to be a key support level. So What: As one of the world's largest gold miners, Newmont is clearly going to be affected by the ups and downs in the price of gold. So it's no surprise that falling gold prices took a bite out of the company's share price. However, Newmont is different from many other gold miners in that it does not hedge its gold sales. While that allows the company to capture more benefits when prices are higher, it also exposes it more fully to price drops. So when gold falls investors are right to be extra bearish on Newmont. Gold, however, isn't the only thing Newmont does. Copper is another important commodity for the miner. And one that is also faltering, with prices retreating notably during July. And, just like gold, Newmont doesn't hedge its copper exposure so ups and downs are felt more keenly on the top and bottom lines than at competitors. Now What: Newmont is actually doing an OK job of weathering the gold downturn, working to better its portfolio of properties via acquisitions and dispositions, and, at the same time, paying down debt it accumulated in the gravy days. But until gold prices recover, and to a lesser degree copper prices, Newmont's results are going to be weak. If you think gold is about to take off, you might like what you see here since hedging won't hamper higher gold prices leading to better results. But if you aren't willing to make that bet, you probably don't want to own Newmont.